You need a reliable and affordable cleaning service to prepare your home and create a welcoming experience for your guests. You want a cleaning service that is available on demand and knows what guests appreciate most. Dhyana Cleaning is the company you’ve been searching for. Our goal at Dhyana Cleaning is to take the work out of preparing your home for each new guest. Your Airbnb rental in Toronto is only as good as your reputation, and any good Airbnb host knows the importance of cleanliness when listing their homes. That’s why our priority is to deliver high quality cleaning, consistently - to ensure you get a 5-star review from your guests! Let us worry about making your rental shine, so you can focus on your core business of getting more Airbnb bookings! Dhyana Cleaning knows that each Airbnb is as unique as its host, with different needs and expectations. Whether it's a personal welcome basket, detailed condition report to help accurately rate your guests, or a special way of staging your home, we've got the package that's right for you. Our Airbnb cleaning packages start at $69.99 plus HST. We provide custom quotes to Airbnb hosts based on the size and location of your property, the tasks included, and the number of guests, so feel free to contact us for your customized estimate. ​You can also visit our Airbnb FAQ page to answer some questions you may have. 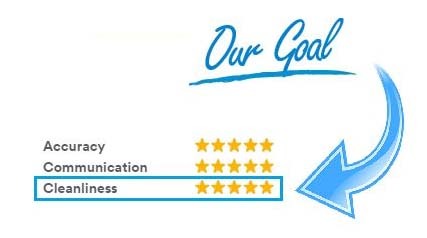 At Dhyana Cleaning, we want to help you achieve 5-star reviews in every category. Therefore, we put together a dedicated Airbnb Resources page which includes information ranging from tips for Airbnb hosts to Toronto event listings that attracts tourists from around the world. Check out this page periodically as we add new Airbnb related articles frequently.